Every member of your staff is vital to your operations, but lack of resources and logistical challenges can make professional development opportunities out of reach for key employees. 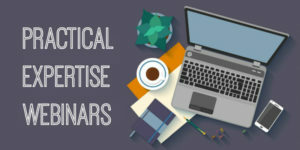 The Forum is pleased to announce the launch of a new webinar series, Practical Expertise, to bring timely training from experts in related fields right to your doorstep. Easy to fit into your workday, these one-hour webinars will offer specific strategies and operational-level advice for some of the most pressing challenges in our field. This webinar was recorded on October 29, 2018. In the midst of a tense political climate, this webinar draws on recent research and real-life experiences to illuminate the real and perceived stressors students face as U.S. students abroad. Panelists Susan Goldstein, Professor of Psychology at University of Redlands, Tracey Bradley, Executive Director of the Tennessee Consortium for International Studies, and Mark Rush, Professor of Politics and Director of International Education at Washington & Lee University, offers practical, tested approaches for diffusing anxieties, responding to problems that arise, and preparing students to be informed and respectful world citizens. This webinar was recorded on September 11, 2018. It features Marianna Savoca, Assistant Vice President for Career Development & Experiential Education at Stony Brook University – SUNY, Whitney Morgan, Experiential Programs Administrator, George Mason University, and Kelly Holland, Associate Director for Institutional Partnerships, Global Experiences. Experts guide participants through important considerations for developing international internship opportunities for students and preparing students to pursue these internships abroad. Topics discussed in this recorded webinar include: Where do the federal obligations intersect? Where and how do they differ? What are our obligations with respect to these Acts? How do we build a culture of reporting and compliance when incidents occur thousands of miles away? The webinar includes three hours of training video and over 15 resources and features experts from NACUA and The Forum on Education Abroad, who respond to questions from an online audience. The webinar was recorded in May 2017 and reflects all current guidance and amendments to the regulations. *The webinar recording contains a factual error: The student mentioned in the update from New York who tragically passed away was studying on a Duke program, not one offered by the University of North Carolina. There are 9 items in the toolbox. Please log-in or join The Forum to access these essential resources. There are 9 items in the toolbox, please login or join to access these great resources.